Bishop Donald Pelletier's MS vocation. 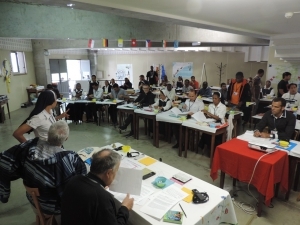 French to English translation of a recorded presentation by Bishop Donald Pelletier as delivered at the REJS 2013 (EUROPEAN YOUTH MEETING) at La Salette. This translation was done directly from the recorded French language delivery of the talk. Paul Dion, Lay La Salette. It is important to know that at 27 years old, the Lord had prepared me for 27 years. Thirteen years with the family. We were people with a good family. Family is very important. Mother, Father, Sister. Family is very important. I was in a surfeit of love. My mother knew that she was going to die, she was sick. So she spoiled me with a lot of love. She knew that she did not have long to live. So I was spoiled with her love. I was ten years old when my mother died. So already the Lord was preparing me. He was showing me that I had to move. This was first intervention of God in my life. It was a very important moment. All was changed. For thirteen years, it was all family. 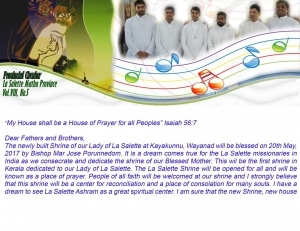 After that it was still always family, but then it was the family of the missionaries of La Salette. (VIDEO) Therefore, 27 years in all. Twenty seven years of preparation. My life, like yours was divided into two parts, if you will. The 27 years of preparation in which God prepared me. 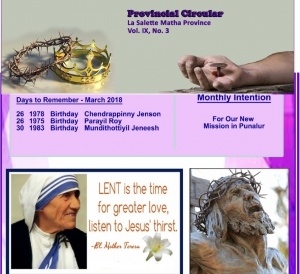 The thirteen years of preparation in my family, by my family, with my family, and 14 years by , in and with the missionary community of La Salette. Therefore, at 27 years old I was ready to leave. I was leaving for the adventure, like Abraham. Leave your country. Leave your family. Go to Madagascar. So, like I was saying, there are always preparations. Along the way I was filled by the community. We had very, very good formators in marvelous locations. The minor seminary was in the country (la campagne). It was on a magnificent lake by the name of Mascoma, in New Hampshire. It was in the woods. It was marvelous for a young man to help him discover nature and to live in a community of friends. Thinking about formation you have some times when you think about what it is that impressed you the most. Our educators became our friends, and continue to be so to this day. I still have some friends among them in the United States. We were 36 when I arrived in the seminary. Two of us were ordained priests. And Father Maxfield is still with us and we are very, very close friends. He is very sick. He was sick almost all his life. He worked in Spain. He suffered for me. I was never sick. I was always able to work. So, like I say, 27 years of preparation. That is very, very important. Thank God. God spoiled me. I thank Him for my human formation. You will see that during your life, your human formation is the most important. The documents from Rome about formation talk about human formation, spiritual formation, intellectual formation, and pastoral formation. Therefore at 27 years old I was ready to leave, as a young priest for Madagascar. It was by boat. So, from New York to Le Havre, by Marseilles to Madagascar we went. 23 days. On the ship, I fell in love. (VIDEO) There was a pretty young lady on board. French. Very pretty. Her father was very rich. He was the owner of the Hotel de France in Tananarive. He had just spent one year in the United States in order to learn English. So, she sees this handsome young American priest and she wants to speak English. I am lonesome. I am ah,ah, little sad, a little lonely. I see this see this young lady, and so for 23 days Donald spent a lot of time with Marianne. Of course, it’s all good; for love. Happily, the rest of the voyage did not last very long. I did not want to lose my vocation. But, you know, the Lord talks to us. “So Donald, you need love? You had your choice.” So I arrived, like I say, after twenty three days. I never saw her again. So, like you already know, I arrived in Madagascar in 1958. I cannot describe all my experiences. There are too many.I cannot tell all the ways that God acts in our life. How God reveals Himself in the events of our life. He makes a lot of marks on us. Then, one day at the parish a woman approached me and said that she too had a child who could not walk. So I took the information, name, address, etc. Then a week later, another one. Then a third, a fourth, a fifth…When I had seven, ooop, we leave for Antsirabe. I take them to the clinic and they stay there. I continue doing this. I bring 10; 15; another 10. I had absolutely no idea how I got into this. I knew nothing about this. And this never came from me. I had never felt a vocation to care for the handicapped. It was an accident. I tripped over this boy in the dark. One boy. When we had 50 the directress of the professor of Antsirabe told that I needed a shop to repair the shoes and the braces of those who were now back in Morondava. “These things do break,” she said. So, we built a workshop. We sent two of the handicapped to Antsirabe to train on how to repair the equipment that had been built for them. We then started this small shop. So we went from one thing to another. I had not one single qualification. Now there are over 100 handicapped children who today walk with braces, thanks to the one little boy. We have come to identify over 700 handicapped in Morondava who cannot walk. We have a foyer for the handicapped, both physically and mentally. We have four religious sisters and two lay people to care for them. We have handicapped people working in the repair shop. I have nothing, nothing to do with this. I know nothing about this. It is God who acts. As a person, so much goes back to the family. There is the community. I could never do anything without my family and the community. Even now. I thank God that I still have family. Cousins, nephews, nieces, aunts and the community and the population of Madagascar. The welcome of the people of Madagascar; The Christian communities of Madagascar welcomed me as a brother. They showed the love and the support of my work. This too is very, very important in our life. You too have your families, the community and your parish. There is a need for this community to supports us. There is the need for us to recognize this community support. While I was in Rome, they asked me, “How did you do it, staying there for 50 years?” I answered that when I left, I told the Superior General, who in those days was father Imhoff, “I’m going to Madagascar for five years.” No matter what I said, I am still there. So, I acted. This work that I was able to do I did it with the Lord. If I had not fallen over that young man, who knows what would have happened. But at that moment, I fell off my pride, like St. Paul. I had sinned by getting angry, but with that, God came and enlightened me through the foundation of the foyer for the handicapped. He showed me the gate of the temple. You know the story in the Acts, in chapter three, when Peter tells the handicapped man, “Of gold and silver I have none, but of what I have I give you. In the name of Jesus Christ, get up and walk.” And it is that, which we tried to do. In Madagascar, in the Malagasy culture, a handicap is like an insult. It is a shame. The handicapped are hidden. The handicapped are hidden because those who know them are ashamed of them. They are ashamed of them. A handicap is deemed to be a malediction. It is considered to be a punishment. 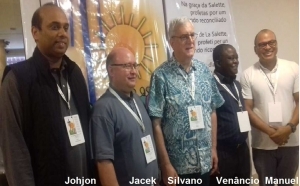 So the marvel that the Lord did was noticed by many people who would come to Morondava and who would ask us, “Why is it that in Morondava you have so many handicapped people?” It is not more than the rest. But thanks to God, we have been able to bring them to the surface. I cannot congratulate myself for this work. I had absolutely nothing to do with it. It is the work of God who weaves the story with us. 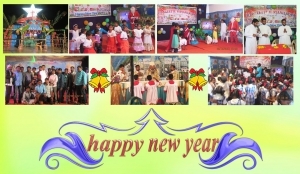 It is a work of God’s love this rehabilitation of the handicapped. Therefore I told this story because it is an example of the work of God through me in my ministry. So, often, people ask me, “What is the most difficult for the missionary?” I say, It is not the culture. It is not the mosquitoes. It is not the doubts that arise in the deep bush. There are times when we feel lonesome, we can feel alone. The solitude can be difficult. At night we are alone. The people retire early. We feel alone. Isolated. It is therefore a grace to run to the only solution, prayer. An encounter with the Lord who reveals Himself to us. Now, my mission is on the coast. I don’t know if you are familiar with Madagascar. It is an island. We were on the western coast. There are very many villages along the length of the coast. There are many of these very small villages who depend on fishing for their living. These villages are populated by 300, 400, or 1,000 people along the whole length of the coast. Our diocese has 400 kilometers of coastline. So I did a lot of travelling on the sea. It was in the pirogue. I don’t know if you know what a pirogue1 is. It is a very, very ancient technology. It comes from Indonesia. The pirogue is not found in Africa. It is believed that people crossed over the ocean in these craft to come to the eastern coast of Madagascar. When you are in the pirogue, you are at the level of the surface of the sea. There is a sail. It is magnificent. If you ever come to Madagascar you have to take a trip in a pirogue. If you want real adventure, take your trip at night. That is a mystical, spiritual experience. You’re in the middle of the ocean, in this tiny pirogue, seated. The wind is pushing you by the square sail. The piroguist is the only one controlling the craft. You are being pushed by the wind in a deep silence. You can touch the stars. And so, you feel very close to the Lord, especially because you know that you’re doing it for the Lord. You know that it is for evangelization. You’re announcing Him. These are consolations that the Lord gives you to let you feel His presence. So one time, I had to leave from a distant village to return to Morondava by sea. This was normally a trip of 4 to 6 hours in the pirogue, if the wind was good. With no wind, or very poor wind, 10 hours. It was Ash Wednesday, the beginning of Lent. They put me in a pirogue with 400 kilos of cargo. ( “Targue”) I was sitting on the cargo. So it was magnificent. The stars, the silence and the gentle wind that was pushing us. But I was being pinched and bothered by the cargo. All night there was no way to find a comfortable position. I couldn’t get comfortable with my derriere being pinched and pricked all night. That is one trip that I will never forget. I was starting my Lent with a sacrifice. So there. That’s how God reveals Himself to us, and offers us consolations as missionaries. Also, one time I was making the rounds on foot. We used to make many rounds on foot. With a back pack, we would walk from village to village. It could be 20, 25, 30 kilometers between villages. You get to a village, stay there two days and move on. One time, we were in a pagan village. The welcome was not that great. I asked the catechist, “How much time to the next village?” He responded, “Two hours walk.” So I said, “We can leave at 4:00 in the morning and leave without breakfast. I can walk for two hours while fasting. After two hours we will arrive at the village and we will have something to eat.” So, we left at 4:00 in the morning. Walking, walking. Nothing to eat. No coffee. Huh. So we’re walking and it is coming up on two hours. In fact, at about 8:00 in the morning we had not yet arrived at the village. At that time I had a moment of weakness. I could not walk. I was just HHIISSSHHHH. I was hungry. I was weak. So I said, “Excuse me but we have to stop. We are going to stop and rest, I can no longer walk.” Then the catechist said, “You stay here. Do not move.” He left. He was on foot. He left his baggage. He left. I was waiting. Not more than 1o minutes, believe me, not more than 10 minutes later, he came back carrying a magnificent honeycomb. He had found a wild beehive and he was able to dislodge the honeycomb. He gave me that and after I had eaten all the honey that I wanted, I was re-energized. Thanks to God, I regained my strength and I was able to continue walking. God was there. I was moved to tears thinking about how God provides. He is always there and He is a constant companion. Here at La Salette, we are reminded of that. We have a very strong example of the truth that when we see, it is easy for us to believe. We are given the example of Maximin’s father who could not think that God was present. But when Maximin told him that Our Mother had told about the episode at the land at Coin, when the father gave his boy a piece of bread made a deep impression. Such a trite and banal act did not escape the vigilance of the mother of God. She was there. It is only after the fact that they remembered and realized that God was there. I was the same. That morning on the way to the village, I was not thinking about God. I was weak. I was afraid. After I had eaten the honey that God had provided in this corner of the deep and isolated bush, I knew in my renewed strength that this was a gift from God. It is through these experiences that we see God in our life. 1. Translator’s note: I kept this word because it is so distinctive. I learned it as a boy because in Canada some people call the canoe, “pirogue.” This is especially applicable to the dugout canoe of the indigenous people of North America. The essential difference from what is described here and the North American canoe, is that the canoe is not fitted with a sail. Fr. Robert Harder - 100 years! Fr. Robert Harder, MS, (District of Switzerland) celebrates his 100th birthday on April 7! He now lives in the community at Untere Waid in Morschwil, Switzerland. First of all, special Greetings from the Eternal City! As I am unable to greet you personally, I wish, through Fr. Belarmino, the Secretary General, to send you our very special Wishes, in the name of the General Council for the unique event of your 100th Birthday. 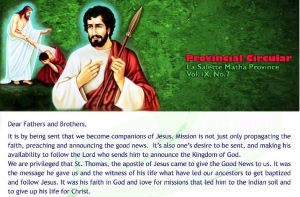 Today, with you we are all grateful to the Lord for the gift of such a long life dedicated to the proclamation of the Gospel in Angola, as a religious and Missionary of Our Lady of La Salette. 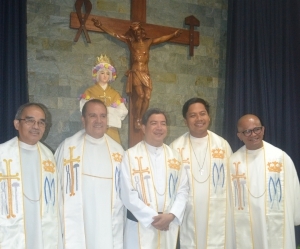 We know very well how much you loved that country and how much energy you have poured out in favor of the people you have met along the road of your priesthood. We are well aware as well of how you never fail to talk to all the visitors of Untere Waid, about the Mission of Angola, the shining jewel of the Swiss Province since 1946, the Centenary of the Apparition. Today, you are surrounded by many friends, brother Missionaries, and the Sisters of the Congregation which you have founded, who wish to share with you the joys of this wonderful and truly special and Unique Feast Day. 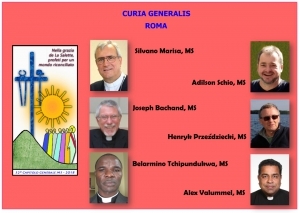 Everyone is here to express to you their sincere and heartfelt thanks for all the good that you have done and the spirit you have planted in their hearts and in so many persons that you have guided through your priestly and Salettine spirit in the land of Angola. 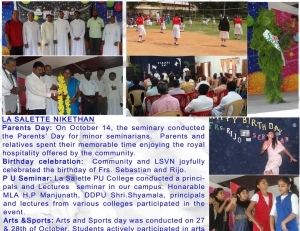 The Congregation, to which you belonged for around 77 years now, is very proud of you as a person and as a La Salette Religious, and invokes the Lord’s blessing that he continues to grant you good health, peace and serenity for all the days that you will be in our midst. May the Virgin of La Salette, continue to be close to you, as she has always been up to now, and guide you always. Fr. 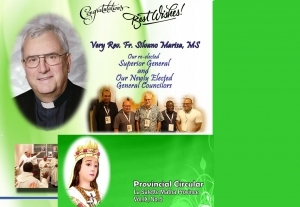 Silvano Marisa, M. S.
I thank Fr. Franz and his council for asking me to speak to you. I am glad to be with you to share some of the modest experiences I have lived while in France. I do this first and foremost as a Malagasy, proceeding slowly (“moramora,” as we say in Malagasy, slowly by never backwards), then as a religious and priest living in the La Salette French Province. It would seem normal for me to preface my experiences with a few words of explanation about how I came to be living here in France for the past three years. 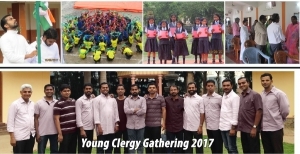 In the program for this Gathering I see that Fr. Gilbert Rakotorahalahy will also be speaking. As a Malagasy I have a have a high regard for my elders, no matter who they might be. Yet Fr. Gilbert holds a special place in my heart. Why? Because it was he who sent me to the La Salette seminary in Antsahasoa in October 1989 when I was only 14 years old. At that time he was pastor of the parish in my hometown of Faratsiho. 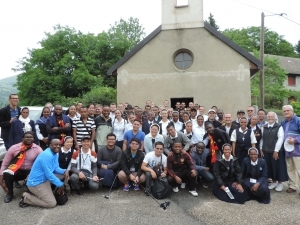 That church had been established by the French La Salette Missionaries and afterward served by Malagasy La Salettes; so don’t be surprised that I say a few words about my La Salette vocation which stems from there. La Salette runs through my veins, or if you want, is part of my DNA makeup! I made my first profession on September 19, 1996 at the La Salette Shrine, Antsahasoa. I did my PPP in 2002 and that same year made my perpetual profession on September 29th. 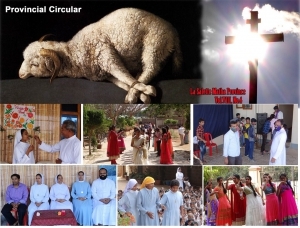 I was ordained on July 29th 2006 at the Cathedral of Our Lady of La Salette in Antsirabe, after which I was named treasurer of the scholasticat and vicar of the parish of St. Louis in Fenomanana, Antananarivo. I remained there until my arrival in France to begin serving at the shrine of Notre-Dame de Chêne in the diocese of Besançon. There you have it! People sometimes ask me: Why are you here? 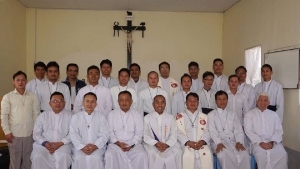 Are there too many priests in Madagascar? The questions are complex; the answers are simple. To the first question I respond: I am here because you are not! The shrine of N-D de Chêne had been falling into ruins, and was abandoned in 2006 with the departure of the Montfort Fathers, who had served there for 90 years. 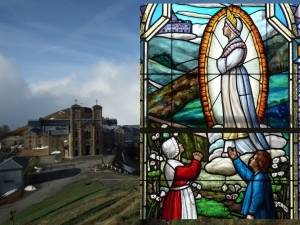 In 2007 the bishop requested that the La Salette Missionaries come to serve the shrine. The French Provincial agreed to send a community. I can say that now the shrine is flourishing. To the second question I respond: It is not that there is a superabundance of priests in Madagascar but rather that there are not enough here. In Madagascar it is true that the number of priest is on the increase and that the median age is decreasing (Yes, a young church!) but there is still not a sufficient number of priest. On the other hand priests here in France are aging and becoming fewer in number. I’m not in the habit of keeping track of deaths, because according to the Malagasy mentality that’s not done! But in my three year presence here in the diocese of Besançon (which I know better than other French dioceses) there have been quite a few priests’ funerals. 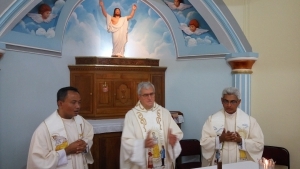 Yet only one ordination, and that a La Salette and a Malagasy on June 26, 2011! We are proud of that. My own coming to France is not by chance or a mishap; rather it is the answer to a call and a free gift. Missionaries evangelized my homeland, the Great Island, and there are still a few French La Salette Missionaries there today. La Salettes were asked to be spiritual animators at the Shrine of N-D de Chène. I’m not alone there. We accomplish this animation as a community, especially in and through daily Eucharistic celebrations, which are preceded by Morning or Evening prayer. We take turns preaching to the neighboring people who come to share in these celebrations. 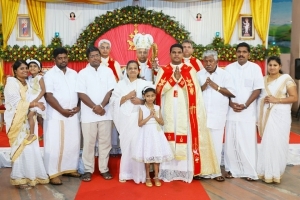 Every Sunday there are two Eucharistic celebrations – one in the morning, another in the evening – in which local residents as well as visitors participate. 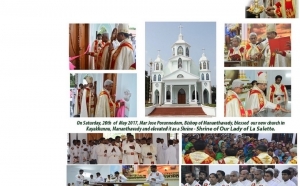 Then there are six pilgrimages for different parts of the diocese which are spread throughout the year. I am aware that a priest is not a priest for himself. 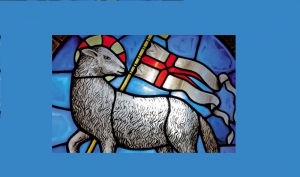 This conviction has led me to be thoroughly involved in pastoral activity: catechesis, confirmation; health ministries (hospital chaplain, service to sick and handicapped). What can I do? Certainly I can’t solve all the problems. The best I can do is to be engaged and carry my part of the load in educating people in their Faith. If I, as a priest, a religious, a missionary, don’t to what I can, then who will do it? If one does nothing, nothing gets done. Of that, I am sure. I must bear witness to my Faith so that people can see by my engagement that I believe. That’s no little thing. I can tell you that ministering to children and to the youth gives me much joy. I truly receive much more than I give. While doing health ministry, apart from working in the hospitals and retirement homes, I frequent and visit many people who live alone, are ill and suffering, along with those who do home-care. And I derive joy from it. It’s not their suffering that brings joy, but, while showing the necessary reserve, joy comes from being with them, showing my concern; “Whatever you did for one of these little ones …” Jesus said one day. I thank God for the quality of service and attention rendered by care-givers to these sick, suffering and handicapped. As I think about what goes on in Madagascar in this regard, I ask the good Lord one thing: that the aged here may be accompanied more and more by their families, and that the indigent of Madagascar (and other countries) have better access to healing remedies. May my prayer be answered. I give this presentation, this witness, but in truth it can only be done because the (my) community sends me here. I do nothing in my own name. It is the community’s mission, not mine! That fact changes everything. 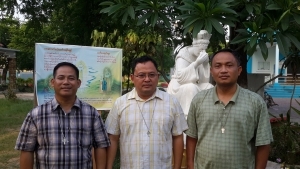 In community, how important it is to strengthen each other through prayer and fraternal admonition because, having recently arrived here, I have a lot to learn. Sharing with one another, which is always a challenge because we are so different one from another, can never be dispensed with. We are all unique, meaning that each one possesses reserves and qualities as well as fragilities and limits. Diversity can prove to be a cherished resource if one knows how to profit by its presence; yet can be an enormous stumbling block if one is stubborn. During these three plus years in France, much water has flowed under the bridge. My inculturation into life in France and my integration into the life of the church are only beginning … and I hope to continually move forward. Let’s see what happens with this total uprooting and complete depart from homeland will bring; it’s not easy (cold climate, language, culture, mentality, food). Adaptation is not a given, it requires time. Time must be given time. But in between time, I’m doing all I can to learn, to inform myself. 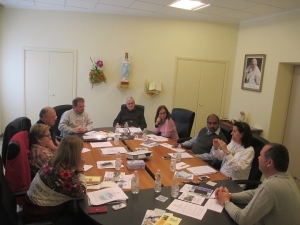 Both the diocese and the province offer many formational tools. I am trying my best to take advantage of them. 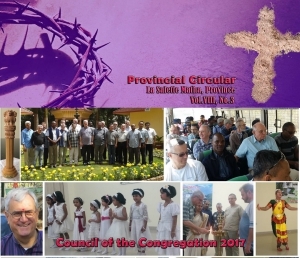 Already, within a month, Dominique will present to us the next permanent formation course on the theme: Our rootedness in the Church of France… WE have already dwelled on the laity, ecology, and being uprooted through Exile… Many other will follow. I can only rejoice and try to profit from these opportunities. Agradeço de coração ao P.Franz e seu Conselho pela confiança em mim depositada. Alegro-me por estar com vocês, e poder partilhar estas modestas experiências, como religioso-sacerdote, vivendo na Provincia saletina da França. No programa recebido consta o nome do P.Gilbert, como co-participante comigo deste momento. Como malgaxe, do que me ufano, respeito muito os idosos, sejam quem forem. Ao P. Gilbert devo muito reconhecimento, pois foi ele quem me encaminhou para a escola Apostólica de Antsahasoa, em outubro de 1989. 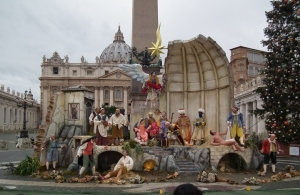 Eu tinha então 14 anos, e ele era Pároco da Paróquia de minha terra natal, Faratsiho. Essa Paróquia, fundada pelos missionários saletinos franceses é agora atendida pelos MS malgaxes. É assim fácil entender como e porque surgiu, desde pequeno, minha vocação. A Salette corre na minhas veias, integra meu DNA. Emiti meus primeiros votos no dia 19 de setembro de 1996, no fac-simile de Antsahasoa. Participei do PPP em 2002, e fiz meus votos perpétuos no mesmo ano, no dia 19 de setembro. Depois de minha ordenação sacerdotal, em 29 de julho de 2006, na catedral de Nossa Senhora da Salette em Antsirabe, fui nomeado ecônomo do Escolasticado e Vigário paroquial da paróquia de Fenomanana, em Tananarivo, até 03 de outubro de 2010, dia de minha chegada a Nossa Senhora do Chêne na diocese Besançon. Com frequência, as pessoas me perguntam: Por que está aqui? Há sacerdotes sobrando em Madagascar? Vive-se a animação espiritual do Santuário primeiramente, nas e pelas celebrações diárias. Não estou sozinho nessas tarefas. Toda a Comunidade está comprometida. A cada um é atribuída alternadamente, a pregação, e estamos todos juntos para a celebração diária da Eucaristia depois de Laudes ou Vésperas. Pessoas de fora também participam de cada celebração. 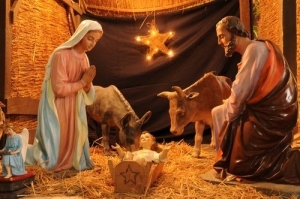 Nos domingos, todos os domingos, temos duas celebrações da Eucaristia, de manhã e à noite. Muitos moradores da região e também pessoas de passagem, participam da celebração. Durante o ano, acontecem 6 peregrinações, vindas de lugares diferentes. As atividades pastorais nas diferentes Unidades pastorais de nosso Decanato, também nos ocupam. No Chêne, não sobra tempo para o tédio. Acontece que, aos domingos, celebrarmos duas ou três missas cada um. 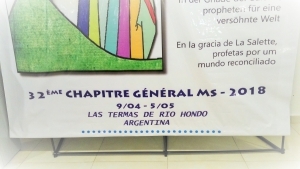 Celebrar a missa é indispensável, mas não é tudo. Sou padre a serviço (os outros também): nem pároco, nem vigário paroquial, nem coadjutor. Estar a serviço? 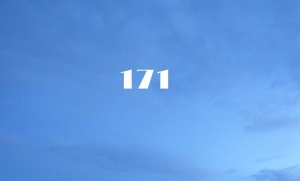 Que significa? Todo padre está a serviço porque é e permanecerá diácono permanente. Estar a serviço é estar disponível. Para que não haja nossa Diocese refletiu-se sobre padres “vindos de fora” (assim somos chamados) Cito (Eglise de Besançon, revista bi-mensal n. 19, de 17 de novembro de 2013) “Não se deve admitir que um padre vindo de fora seja visto como uma emergência, uma ajuda esporádica, ou, pior ainda, como um ‘tapa buracos” em tempo de penúria”. Esta questão foi levantada numa reunião dos padres coordenadores e os delegados pastorais do nosso Decanato. Que pensar disso? Estou consciente que se é padre não para si mas para os outros. Esta convicção faz com que me engaje diretamente na pastoral: catequese, preparação para a confirmação, pastoral da saúde (Capelania do Hospital, Evangelho para os doentes, Pastoral dos portadores de deficiências). Na preparação para a Confirmação, procuro trazer o meu tijolo na construção da fé. Não consigo fazer tudo, mas se eu padre e missionário não o faço, quem vai fazê-lo? Se nada fazemos, nada é feito. Estou convencido: Devo testemunhar minha fé para que as pessoas percebam o que creio: é pouco, mas já é alguma coisa. Estar com esses jovens me traz muitas alegrias. Mais recebo do que dou. Na pastoral da saúde, além das celebrações regulares no hospital, nas casas de acolhida das pessoas idosas, das que vivem sozinhas, doentes ou sofredoras, dos cuidadores de doentes, de auxiliares domésticos, encontro com muitas outras pessoas Estou contente com isso. Não são os sofrimentos dos doentes que me fazem feliz, compartilhando com eles, - guardadas as devidas distancias - mas o fato de estar com eles: “tudo o que fizerdes a um destes pequeninos” diz Jesus. Agradeço também a Deus pela qualidade dos serviços e atenção dispensada a essas pessoas doentes, com deficiências, e sofredoras. Olho para Madagascar e para outros países e rezo a Deus dizendo: que as pessoas idosas sejam mais amparadas por suas famílias. O testemunho não é meu, mas de minha Comunidade que me envia. Nada faço em meu nome. A missão é da Comunidade e não minha! Isto muda todo. Na Comunidade, como é importante de amparar-se na oração, corrigir-se fraternalmente, pois nem tudo é claro para mim que acabo de desembarcar. A partilha fraterna é um desafio permanente e indispensável, porque somos diferentes. Somos únicos, cada um com suas capacidades, fraquezas e limites. A diversidade é uma riqueza se soubermos aproveitá-la, mas pode tornar-se um estorvo enorme se nos fixarmos em nossas ideias. Depois de três anos passados na França, muita água correu debaixo da ponte. Minha adaptação à cultura francesa e minha integração na vida eclesial estão apenas começando... penso continuar. Não é fácil. Requer tempo. Dar tempo ao tempo. Mas tudo faço para que aconteça. Muitas informações nos são passadas seja pela Diocese, seja pela Província. Procuro seguí-las. 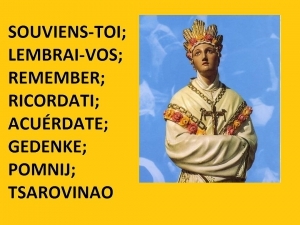 Logo mais, com Dominique, teremos mais uma etapa da formação permanente: Nosso enraizamento na Igreja da França. Já abordamos temas sobre laicidade, ecologia e desenraizamento no Exilio. Muitos outros seguirão. Alegro-me em poder usufruir ao máximo todas estas oportunidades. "I just returned from a five-day visit to Mandabe. The road has not gotten any better since the times we traveled it together years ago. How many years is it now – 5 or 6 – since the approaches to the bridge at Dabara were washed away? The bridge still sits in the middle of the river with no way to get on it. Meanwhile we have to plow through about two miles of shallow water and deep, fine sand to get across. "As always it was a very sentimental trip as I can't but think of George and pray for him when I am there. An enlarged photo of him adorns the back wall of the church. Fr. Richard – an Italian priest incardinated into the diocese and who is presently director of that missionary district – says that George's presence is still vividly felt. I am amazed to see the continual growth of this Christian community. I think it is the district that has shown the most progress and growth in the last six years.